• How did you get into running? I’ve never thought of myself as a runner or athletic in any way, until the summer of 2015 when I had decided to run a few laps around the nearby track. I remember seeing this older man in his 70s, and he was outrunning me. I was inspired, even though I felt like I had died trying to run two laps. I remember being so out of shape and having to walk the 1 km to the track. One day it just clicked, and I realized I was able to run to the track. Before I knew it I was running up and down Burnaby Mountain. A coworker convinced me to make start running at lunch since I used to work by the coal harbour seawall, and it changed my life. 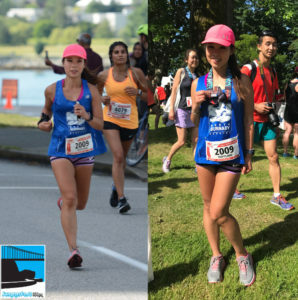 I signed up for my first race (Eastside 10k), and I fell in love. I signed up for BMO shortly thereafter, and that was my first half marathon. It has been a passion/addiction/love affair ever since, and I still run on most days at lunch. • Do you run with a group? A friend introduced me to North Burnaby Runners last year, and I was very reluctant to run with them at first due to my work schedule, and the fact that I enjoyed running alone. I joined them and the Metro Run Crew for a special yoga run last May, and I became part of a group! I have been running with NBR for over a year now, and it has changed the way I view running. Most of my friends don’t run, so it was a great way to meet others who shared the same passion. It is as much a social thing as it is about running, but I’ve also become a stronger runner because of the run group, too. I always tell people to try it once, and there are so many awesome run crews in this city. I’ve also run with West Van Run Crew, and East Van Run Crew. They are all awesome people, and it is nice to run a race and have people to cheer you on, and celebrate with. • What motivates your running? I simply love the feeling of being outdoors. My favourite distance right now is still around 20-22km, but I am very motivated by the idea that our bodies are amazing and capable of so much. I love running in new and different places, and working towards new and bigger goals. All this, and coffee and brunch. • What helped you decide to run in the VFAC Summerfast 10k this year? A few people I know from my run group ran it last year, and it looked like a new and interesting local race to me. • What is your career and how does that balance with your running? People often think I work in the running world, since running has become such a huge part of my life. I’ve just changed careers, and I did it mainly to have more work-life balance, but the learning curve and demands have been so high I am still adjusting. I try to fit a lunch run in every day because it breaks up my day, and helps with mental clarity. A year from now I hope that this career transition would help me achieve more running goals by giving me the financial means, and flexibility to adjust my training to whatever goal I am pursuing. • What pearl of wisdom have you acquired from your running experience? Never compare yourself to others–mileage wise, or pace wise. It is your own journey to enjoy, and stretch and roll lots. • Let us know your social media channels for others to share in your running journey.